1.1 Benefits Of The Anker Soundcore Mini Bluetooth Speaker with FM Radio. Are you tired of the wired speakers around your devices? If you are, then it is high time that you invest in the new age wireless speakers, because all those (…) lose cables were driving me insane during my backpack travels and road trips. Worst part? I would lose those cables as well! Don’t worry, we have taken care of the testing part for you and I highly recommend the Anker SoundCore mini, Super-Portable Bluetooth Speaker. This type of bluetooth speaker is a gift from the travel heavens for any road tripper, backpacker hiker or vanlifer. They are small, easy to use and affordable. Now you have to keep in mind that it is a low-budget version of Anker, but that does not mean it can’t be of great quality. Benefits Of The Anker Soundcore Mini Bluetooth Speaker with FM Radio. There is a lot to talk about the new generation of bluetooth speakers under 100 USD for customers with a tight budget. Not everybody can afford those fancy high-tech brands, but to be honest.. you really do not want to! Why not? You are a travel! You like to go on the road, explore, camp, hang out with friends, swim in lakes and just cruise around during those long summer vacations. You are not interested in babysitting a 400 + USD gadget all the time right? Especially if you are traveling to another country! Well, in order to find out let us take a look at the benefits, shall we? Sure, but I am sure you will find the special features even more important. Let’s see what makes the Anker SoundCore Mini so special. You can transform any outdoor gathering into a fun-filled party with this speaker. Trust me, I have done it many times including on top of mountains, lakes and campfires. I made a summary for you to check out the special features of the Anker SoundCore Mini Bluetooth. Design – It has a neat design that looks very attractive to everyone. The clear design and the orderly placement of the buttons lend it a beauty that is beyond explanation. Sound – I agree with most people who say it has a great a sound because the advanced 5 Watt driver with a passive subwoofer. You will never have to worry about sound anymore for sure.Is it the best sounding portable bluetooth speaker? It sure is! Battery – Another remarkable thing that you must know is the amazing battery life of this speaker. It can entertain you for 15 long hours and if you are spending a night outdoors, then this can only add to its charm. Party! Speakerphone – Yes, you heard us right, as it can answer phones while playing music. The built-in microphone certainly makes it worth the effort and you can activate voice commands as well with this one. Controls – The Anker Soundcore has a set of organized controls that assist you operate the speaker. I assure you that will never find anything remotely as clean as this one. IT is simple to use and works perfect for beginners. It can work well within 66 feet radius. I got all the way up to 85 feet in the city of Rome! You cannot hang it from you bag or backpack, as there is no attachment to it. I put it in the side pockets of my backpack and it was fine! 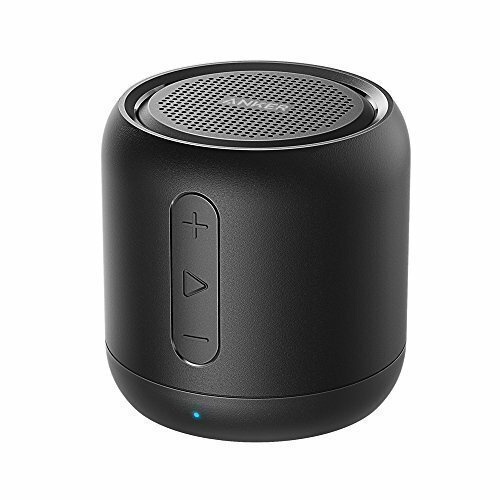 To be more precise, the Anker SoundCore mini, Super-Portable Bluetooth Speaker is not just another speaker. It is one of the best products in its price-class. The sound is pretty good and it has been priced reasonably well, what more do you want? It is perfect for those long summer road trips and hiking adventures! So, if you are in search of a quality low-budget Bluetooth speaker, then this has to be it. We want to know your thoughts about the Anker SoundCore Mini! Also check out our anker soundcore sport xl review! Are you tired of the wired speakers around your devices? If you are, then it is high time that you invest in the new age wireless speakers. Don’t worry, we have taken care of the testing part for you and recommend you to read this Anker SoundCore Mini Review.